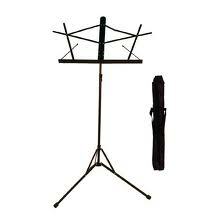 Two piece adjustable, folding music stand. Ideal for maintaining correct posture while practicing at home or performing. Highly portable, lightweight design features music clips to hold pages in place. Comes with bag for easy transportation.